The Australian Transport Safety Bureau had advised that "the area can now be discounted as the final resting place of MH370". SYDNEY: Australia on Thursday ruled out a large swathe of Indian Ocean as Flight MH370's final resting place after a lengthy underwater hunt, as a US Navy official queried whether the missing plane ever went there. The Joint Agency Coordination Centre said that the search with a mini sub of an area where acoustic transmissions were detected in early April was now complete. "The Joint Agency Coordination Centre can advise that no signs of aircraft debris have been found by the autonomous underwater vehicle since it joined the search effort," JACC said. 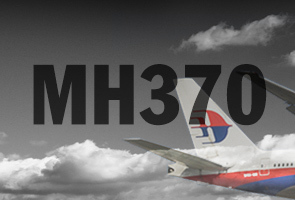 It added that the Australian Transport Safety Bureau had advised that "the area can now be discounted as the final resting place of MH370" in an outcome that will extend the agony of relatives who are desperate for closure. Australian ship Ocean Shield, which is carrying the US Bluefin-21 sub, has now left the area after scouring 850 square kilometres (340 square miles) of sea bed for the jet that vanished flying from Kuala Lumpur to Beijing on March 8 carrying 239 people. The end of the underwater mission came as the US Navy's deputy director of ocean engineering Michael Dean told CNN that the pings at the heart of the search were no longer believed to have come from the plane's black box. He said that if they were from the on-board data or voice recorders they would have been found by now. "Our best theory at this point is that (the pings were) likely some sound produced by the ship... or within the electronics of the towed pinger locator," Dean said. He said it was not possible to absolutely exclude that the pings came from the black boxes, but there was no evidence now to suggest they did. A US Navy spokesman later said his comments were "speculative and premature". Australian Deputy Prime Minister Warren Truss said the search was concentrated where the pings were detected because it was "the best information available at the time", without commenting on whether they came from the black box. He added that Australia remained "very confident that the resting place of the aircraft is in the southern (Indian) Ocean". The US Navy pinger locator, dragged by Ocean Shield, was used by searchers to listen for underwater signals in the remote southern Indian Ocean in an area where satellite data indicated the plane went down. A series of signals it picked up prompted Australian Prime Minister Tony Abbott to say he was "very confident" they were from the black box, which led to the deployment of the sub on April 14. JACC said the operation would now move to the next phase involving sophisticated equipment to scan the unmapped ocean floor, with all existing information and analysis reviewed to define a new search zone of up to 60,000 square kilometres (23,000 square miles). Australia has previously said this work could cost Aus$60 million. It is not clear how expensive the search operation has been so far. Scott Hamilton, managing director of US-based aerospace consultancy Leeham, said all the data would have to be re-examined "from start to finish" but he did not believe the search would be called off any time soon. "I think it will be some time, perhaps years, before they completely throw in the towel," he said. Many relatives of those on board, who were mostly from China and Malaysia, have voiced frustration over the lack of progress with Sarah Bajc, partner of American passenger Philip Wood, unimpressed by the latest developments. "So what do I think of this new twist? I think it is consistent with the tangled mess that is this supposed investigation," she told AFP. Relatives accused Kuala Lumpur on Wednesday of withholding crucial data after it released a 47-page summary of communication logs from the plane recorded by British satellite operator Inmarsat -- information they had long demanded. Malaysia insists it is doing all it can in what is an unprecedented situation. Relying in part on the Inmarsat data, officials believe the jet inexplicably veered off its flight path before crashing into the sea, possibly after running out of fuel.